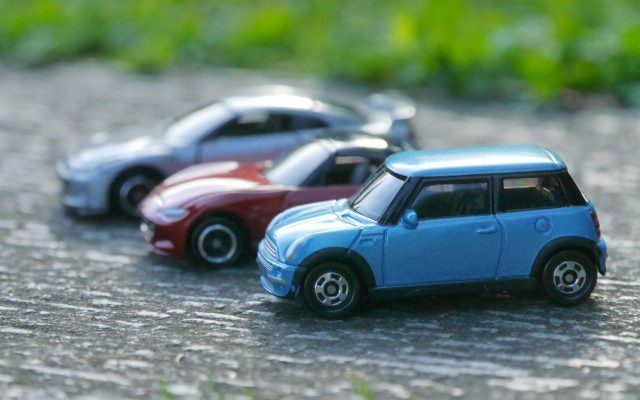 You must feel like you are on the top of the world when you get your first car. I remember I was so excited to go to the car dealer when my car was delivered. Brand new car is of course clean and shiny and I was happy just to look at it. However 1 month later we find a problem. Once you see the dirty car, driving is not that fun and we wonder where the exciting feeling was gone. How can we keep our cars clean? Here’s the guide of beginner’s car detailing. If you have an outside water tap then it’s ok but if you park your car in a shared car park or somewhere you cannot wash, you have to find a place such as a car wash place. Essential tool to wash a car. At a car wash place you can use the equipped one. When you use a car shampoo, you need one. You can get it at 100yen shop! You can purchase at a car accessories shops such as Autobacs. Some people use kitchen detergent instead. Some people use kitchen detergent instead. Microfiber cloth would be the best. Available at a car accessories shop and a hardware store. Car wash is the best way to clean your car. If you wash your car every week, it will keep the shine for many years. If you think weekly car wash is too much, wash your car at least once a month. 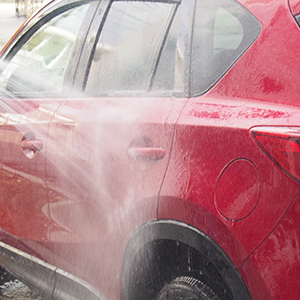 First rinse your car thoroughly with plenty of water and remove loose dirt and grime. 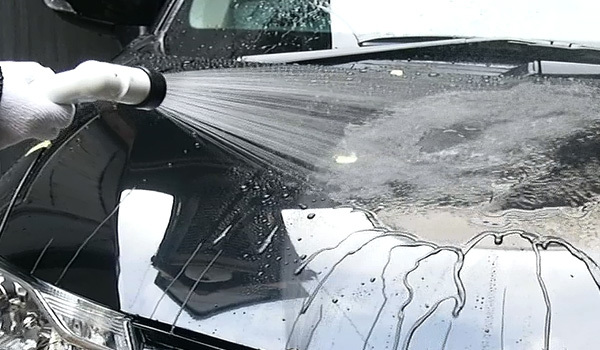 If you start washing without this step, your car will get scratches. And do not work in direct sunlight. Put water in the bucket and pour the car shampoo. Let’s start washing once you make enough bubbles. Wash the bottom parts such as wheels in the end as they are the dirtiest parts. Also use another clean microfiber cloth when you wash window parts. 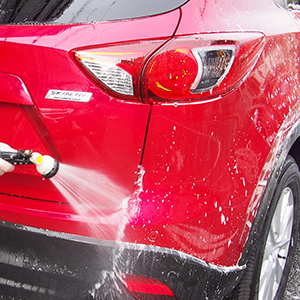 After you wash your car with the bubbles, rinse your car with plenty of water. If the car shampoo solution is left, it might leave some streaks. 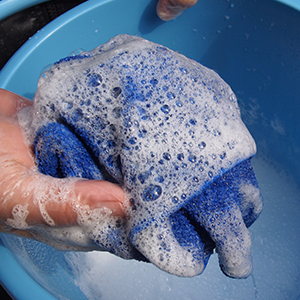 Dry your car with a clean, dry microfiber cloth. This is the most important and hardest part of car wash. If you do not wipe and dry the car body quickly, water drops might dry up and leave water spots. Use another dry microfiber cloth to dry completely if needed. Wipe small parts such as window and door jambs as well. Now your car is clean. If you want more shine, let’s move to Step 02. For those who wants to get more shine and gloss, please try a car coating. 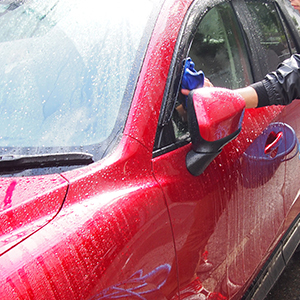 There are variety of car coating: car wax, polymer coating and glass coating. Here’s some tips what to choose. Car wax is good to get quick gloss without spending a lot of money. Spray polymer coating for easy application. For brand new cars glass coating is recommended. Those car coatings are available at online marketplace or car accessories shops. Find the one for you. Do not apply any coatings, wax, polymer or glass coating when it’s raining or under blazing sun. More possibility to end if failure. Do not work under direct sunlight as the coating solution dries quickly before wiping. Also use proper amount of the coating solution. Applying too much solution might cause foggy streaks. Some people misunderstand that if you apply car coating, you do not need to wash your car. Dirt is hardly attached after coating but you still need a regular car wash. Dirt will definitely be on the car coating and if you leave it, it might adhere to the car body. 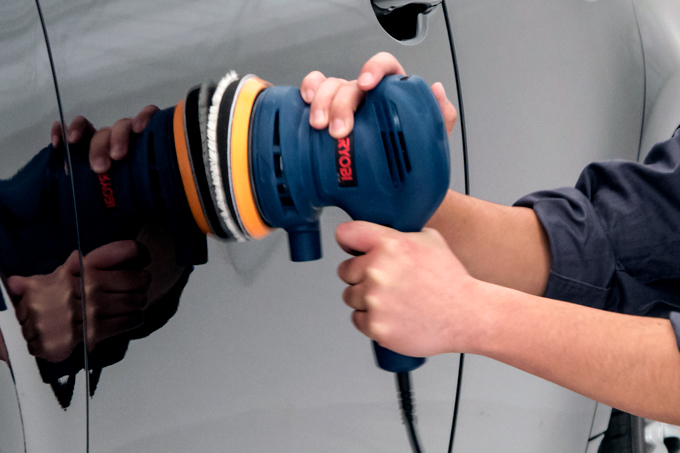 None of car coatings offer maintenance free. Regular car wash is necessary to keep your car clean. If your car body is covered all over with scratches, you can remove them by polishing with compound. Some people believe that’s professional’s job but if they are shallow and light ones, it’s not that difficult to do it by yourself. Try to remove small scratches first. Put liquid compound on a sponge and rub. If you think you can do it, consider to get a polisher. If you leave your car wet after rain or car wash, the water drop dries up and leave water spots or ion deposit. They are caused by mineral in water left on the car body. Once you get them, it’s hard to remove by car wash.
You have to polish with compound or use chemical remover such us ion deposit remover. Ion deposit remover is easier than polishing so please try it. I write about exterior detailing this time but of course you should clean inside your car as well. Floor mats have mite, hair and crumbs more than you think. Keep a car cleaner and microfiber cloths in your car. What is the best for removing scratches? Car Wax or Car Glass Coating? Want to remove scratches on the car body! What should we use? How do you do the maintenance for your precious car? There are quite a few people who are obsessed with washing a car regularly and detailing car wax or car coating. Your precious car which you have in your daily life. Not only when you crash and scraped your car but also there are many chances to damage surprisingly. For example, stepping-stones, sands, using a washing machine and so on. Whatever any situations it is not good your precious car is caught a damages, isn’t it? Then, we’re going to introduce which items are effective for removing scratches. There are many types of scratch-off car wax. We will explain about the difference roughly. Basically it does not contain any polishing agent like compound. It makes a car shiny by filling in the scratches. Basically it contains polishing agents. The ingredient of polish in the wax makes scratches less noticeable. Also the ingredient of wax makes a car shiny. Many products are based on polymer. It depends on products polishing materials have or have not. This is easier to apply than any other types which is good point. The cloth has already contained wax. It can wax a car with just wiping. This is very workability, but its durability is so-so. Car liquid compound makes scratches on the car body less noticeable by polishing to make the car body around the scratches gently. Please use the appropriate type of compound which depends on the depth of scratches. If you want to remove a deep scratch, you should polish with rough compound, and then, you should polish with fine one and finish it. We introduced about car wax and car liquid compound mainly, but especially car wax might be difficult to choose the best one because there are beyond the number of products on the market. From now, we would like to explain about more detail. Is it true that car wax cannot effect depends on its ingredients? Truly, there are many types of car waxes. Moreover, if you have a mistake to choose it, the car body might be caught damage by its ingredients or might get the less effect. Therefore, you should understand about types of car waxes and let’ choose the appropriate one! It can polish the car body and remove scratches, but not for deep scratches. Some water spots and dirt are removed as well. If you polish it strongly, there is possibility to make small scratches on the car body. Therefore please do not polish with too much. Scratches are removed by polishing, so these become less noticeable even though the car wax is off. however, it also polish not only scratches but also the car body little by little at every applications. Please be careful when you apply it for plastic parts. They are almost paste type and liquid type. This type of compound is silicon fills in scratches and it make them less noticeable. However, it just makes scratches less noticeable, doesn’t remove. So after car wax comes off, scratches become noticeable again. We don’t recommend this if you are reluctant to polish the car body. Also this is almost type of solid type. Car wax is not durable such as glass coating. but we recommend to apply car wax once a month even though solid type which is the longest durability in these. If you leave your car long time without car washing after you apply car wax or apply it too much, these cause oxidation of car wax and it sticks to the car body. Then it is very difficult to remove it, sometimes your car might be damaged. Moreover, it looks not so good due to black and yellow stains. Especially, please be careful about gaps in a hood, this part is easy to oxidize. In the long run, how about scratch-off car wax? 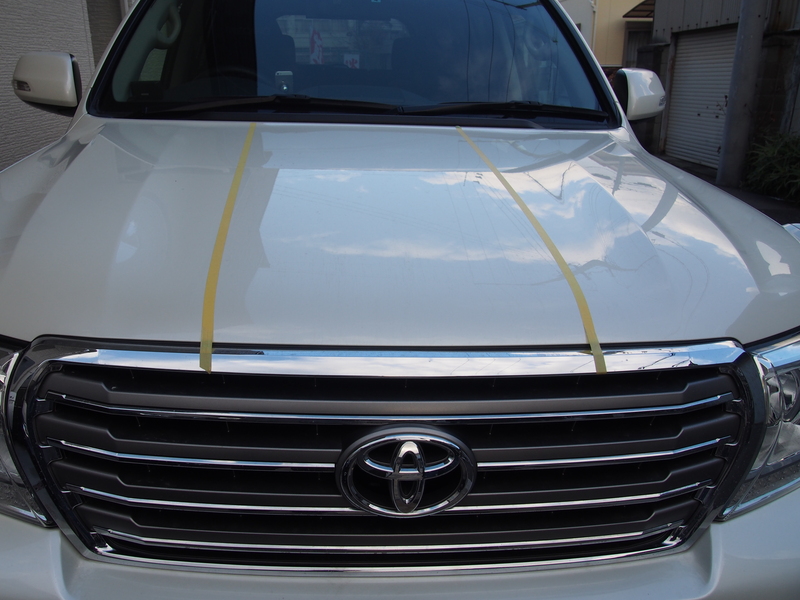 It cannot remove them completely and the car body is damaged by using the car wax again and again. However, the type of fill-scratch cannot remove scratches themselves. Therefore we think that polishing with compound is the best way for removing scratches. We would like to describe how to polish with compound below. This is the best! How to remove scratches and make a car glossy! We understand that “removing scratches = making scratches less noticeable”. You might think like this. To tell the truth, for removing scratches, polishing with compound is the most excellent. Compound is a fine-grain and there are a several types such as coarse and fine. It sounds difficult, but saying in an easier way, it is a liquid version of fine for a wood. The work is by using a sponge or an electric machine. If scratches are not so deep, they can be removed because polishing tears off scratches with the car paint surface together thinly. Also compound can remove stubborn dirt which cannot be removed with normal car shampoo, such as water spots, the pitch, droppings and so on. For this reason, it is not too much say that the car body rest by polishing at once. However, please make note that polishing with compound has demerits. It polishes the car paint surface and the clear layer even though the compound is how fine. you might need more repairing because the car paint surface is polished, too. This is the one of troubles which can be happened when we use the polisher. rarely the car paint surface becomes whitish like a thin haze due to the heat. Moreover, using a polisher has some problems which that a polisher is expensive and it needs a source of electrical power to use. Special paintings, for example a scratch sealed and self-restoring coat, should be better to avoid unless we find the influence by polishing as much as possible. The car paint surface cannot be undone at once you polish, if you feel fear of these demerits, asking professional car detailers can be the one way even though it is expensive. This is just an addition, after you polished the car body with compound, it is the perfect time to apply glass coating!! Because the car body is clean – there is no scratches, the dirt and the oil – the preparation for glass coating finished already. You can apply glass coating immediately after you wash the car with car shampoo carefully and drying the water. Surely it can keep a car beautiful and glossy. We recommend it highly even though it is a little bit time-consuming. By the way, glass coating is able to make superficial scratches less noticeable. Prevent against daily scratches by glass coating! From this paragraph, we described about how to remove scratches which has already been on the car body. Nevertheless, if we’re going to do it, it is much better than it we can prevent against scratches, isn’t it? Of course, if your car gets scratches, you can deal with them by filling or polishing unless the scratches are very deep. As we said above, we polish the clear coat and the paint surface. If we polish a car every time when the car gets scratches, its car paint surface will run out. 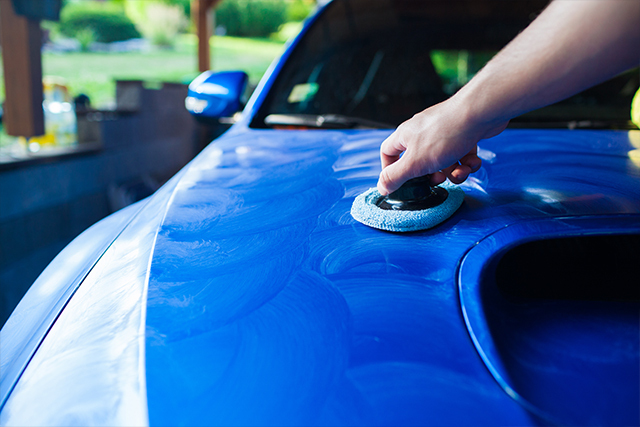 If you prevent against scratches in advance, you are caring and keeping your car beautiful, don’t you? Then, for the prevention of scratches, glass coating is highly recommended. Please consider about “100% genuine-glass coating”, not “glass-like coating”. 100% genuine-glass coating forms the glass layer on the car body. ▼Our Pika Pika Rain PREMIUM is like this. but the car body is protected by the glass layer indeed. The glass coated car body is harder to scratch than the naked one. Sadly, a car will be got some scratches by all means, such as driving, parking, daily washing and using a car wash machine. the area where gets scratches is the glass layer on the car paint surface. so the damage will be reduced quite a lot. and then the scratches is made less noticeable due to the reflection of the light. The reapplied parts the strength of glass layer become stronger, so that is killing two birds with one stone! so we recommend it strongly because dust and droppings are removed easily and then you can cut the time for daily car washing. Therefore, we recommend Pika Pika Rain PREMIUM for not only the prevention of scratches but also the maintenance! The faded black plastic parts by the long-term deterioration can take back its original color by applying Pika Pika Rain PREMIUM, too. Please don’t forget to apply this part! Perfect application with Pika Pika Rain after removing scratches!! From now, we would like to explain how to prepare and apply Pika Pika Rain PREMIUM step by step. First, remove the dirt which is adhered on the car body with plenty of water. After this, make bubbles with car shampoo and wash a car with microfiber like you stroke it softly. Finally, please wipe off with another dry microfiber cloth or microfiber chamois completely. It can solve almost all of problems like scratches, water spots and so on. Compound is also useful for removing old car wax or car coating. Pika Pika Rain Liquid Compound has two types, Fine and Ultra-Fine. Please apply Compound Fine for scratches or swirl marks removing. On the other hand, Compound Ultra-Fine for final mirror finish. First, put proper amount of compound which you shake it well on a sponge. Next, apply compound straight forward. Please move to a next small area and repeat these steps to finish. Next, move a polishing machine horizontally and buff the area that needs attention. Please be careful not to polish too much for both cases. Moreover, after polishing, please don’t forget to wash a car well and wipe off the water with Pika Pika Rain Microfiber cloth. Remove the oil with Pika Pika Rain Oil Remover. but it makes car glass coating is better, so we would like you to do it even tough your car is brand new. Finally, after the preparation, let’s move to the application of glass coating! At first put proper amount of Pika Pika Rain PREMIUM on a sponge (The first time is 5 or 6 drops, after that please add 2 or 3 drops) and apply to the car body with the sponge thinly. Then immediately please wipe the area where you applied in with Microfiber Cloth. We recommend to repeat applying the car body into small areas. If you apply it for a spread area at one time, the liquid get dry and you cannot apply it evenly. This is how to do the preparation and apply Pika Pika Rain PREMIUM. Some of you might feel troublesome about STEP2 and STEP3, but the durability of glass coating will be quite different from you do it or do not it!! Car wax can last from one month to three months. However, Pika Pika Rain PREMIUM can last three years at once you apply it!! We introduced about many merits and demerits about glass coating, but if we’re going to do the application, it is important to think about its caring for the future. Of course it is not bad to make a car beautiful with the paste wax. However, when we think about the durability of gloss, we can recommend glass coating because it forms the glass layer and it can last three years. We cannot help avoiding scratches on the car body in a daily life. If we apply the car wax to them less noticeable, but after the car wax removed, scratches are remarkable, again. you don’t have to be worried about scratches not to damage on the car paint surface directly, because they are on the glass layer of glass coating. Car wax is cheaper than glass coating, but we have to apply car wax many times. Therefore, the application of glass coating which is only one time should be very easy. You might think that paste car wax with polishing materials and gloss, but the after caring is hard and you glass coating is better. Both of them have their own good sides, it is the best you can care about your car by your own way which adjusts your preference and your life style. Get the ultimate gloss! Tips for making a car glossy. A glossy car is so cool!! Have you ever been surprised when you had seen car bodies at exhibitions? Everyone who loves cars ought to think like this. A beautiful car catches everyone’s attention, doesn’t’ it? Because we can find the owner cares about it well and before everything that the car is very attractive. The car which we said above is applied some coating to the car body. Unfortunately, it is impossible to get an attractive gloss by only washing a car. Many people who can keep their cars beautiful might spend a lot of money for polishing and applying glass coating by professional detailers to make their cars glossy. We cannot do full-scale polishing and coating by ourselves, it is too hard to apply by ourselves, so there is the only one choice which is asking professional. 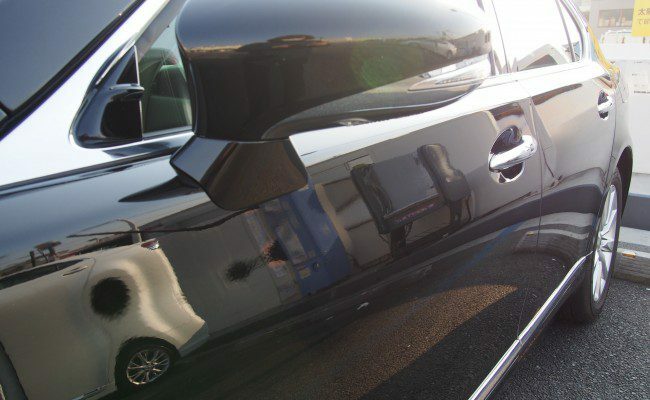 However, it is too costly and time consuming you ask professional detailing every time your car is caught scratches or glass coating starts to come out. 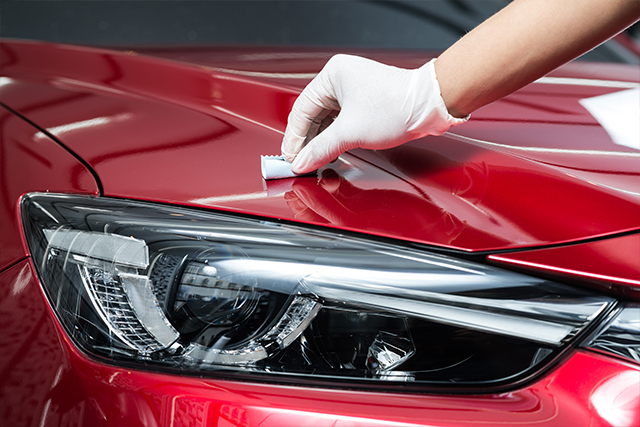 For you who think above, we would like to introduce the low-cost way and tips of making your car glossy like an exhibited car on your free time. First is the explanation about three necessary things to make a car glossy – “car wax”, “car polymer coating” and “car glass coating”. Maybe many people have already known them, but we summarize each (gloss, features and durability), so let’s make your car glossy by the best matched way for you! Also tips how to make a car glossy are mentioned below, so we very much hope you will read it until the end. Mainly there are three kinds which can give a car gloss – Wax coating, polymer coating and glass coating. Before solid wax was main as making gloss, however, in these days, the number of DIY glass coating and people who apply them are increasing. To be honest, it is very difficult to say the answer because each features are so much different. Then, what is the difference between wax and glass coating? You need to wipe it off after applying due to carnauba which is the main ingredient. Please make note not to apply it too much even though you want to make a car glossy. Because there is possibility that you cannot apply evenly now wipe it off completely. Its gloss and shine are strong due to the main ingredient. About from 1 month to 3 months. It depends on circumstances how to drive and keep a car. If the rainy weather continues, car wax is taken out easily. Moreover, because the oil is contained, so if you leave a car without any maintenance, it might change to stubborn dirt. Therefore you need daily washing and waxing a car. Between car wax and glass coating. It has both shine and translucent gloss. It is a simple type of coating which is contained a mixture of a lot of silicon, resin and sometimes glass component, too. Almost of them can apply easily, it is finished only by spraying/applying and wiping off. 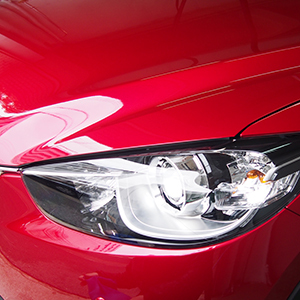 It doesn’t have gloss like car wax, however, it can get strong and translucent gloss like glass coating. From 1 month to a half year. It depends on the ingredients, however it is no longer than glass coating same as car wax. If you want to keep its gloss, you need to apply it regularly. Elegant. It is moist like it gets wet. It also makes your car deep color. It doesn’t have the glare gloss like car wax because it doesn’t include fats and oils, but, the car body is coated by glass and it makes the elegant and translucent like an earthenware. When you apply car wax, you apply it whole of the car body and wipe them after a while. 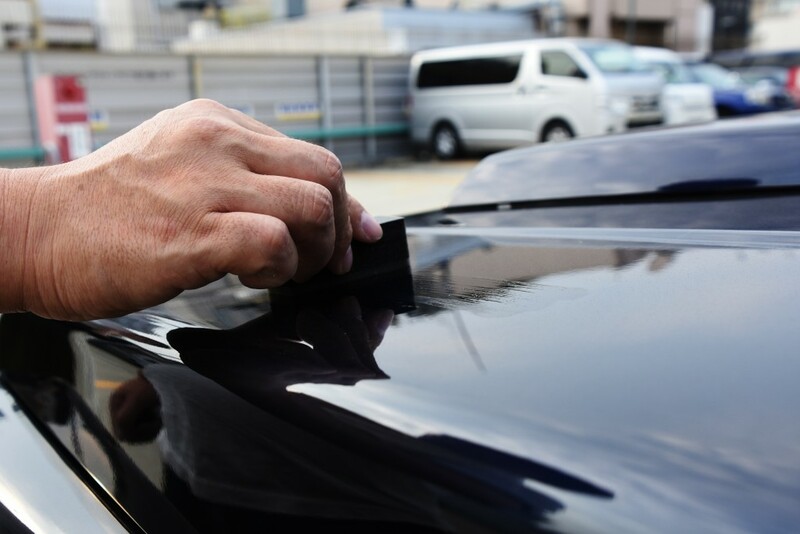 On the other hand, when you apply glass coating, the work is a repeat which applying the surface of the car body into small areas and immediately wipe there. It is recommended if you need beautiful and natural gloss which doesn’t insist too much. In the case of Pika Pika Rain PREIMIUM, it is crystalized by moisture in the air, so you have to wipe off water and dry the car body before you apply. 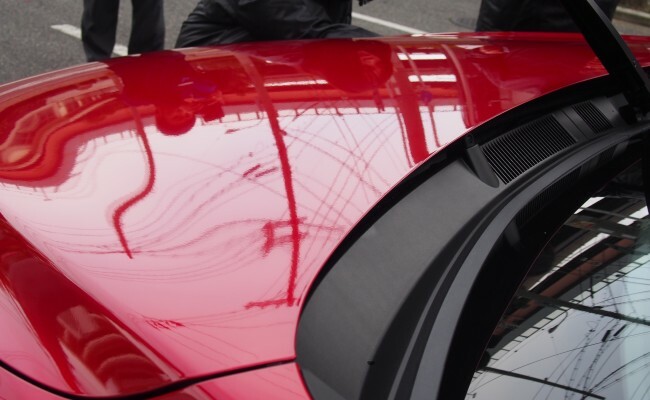 It isn’t removed easily because it forms the glass layer on the car body. The gloss will be lost by getting dirt under circumstances of driving and rainy weather, however usually it will get brilliance by careful washing with car shampoo and applying car detailing agent. In addition, the glass layer doesn’t drop off unless you polish it with a polish machine. Can you imagine the product which may get your favorite gloss? Also it might be good that choosing whether it is possible to take care of glass coating easily in your daily life. Please make note that we talked above only for a new car which doesn’t have scratches and dirt much. 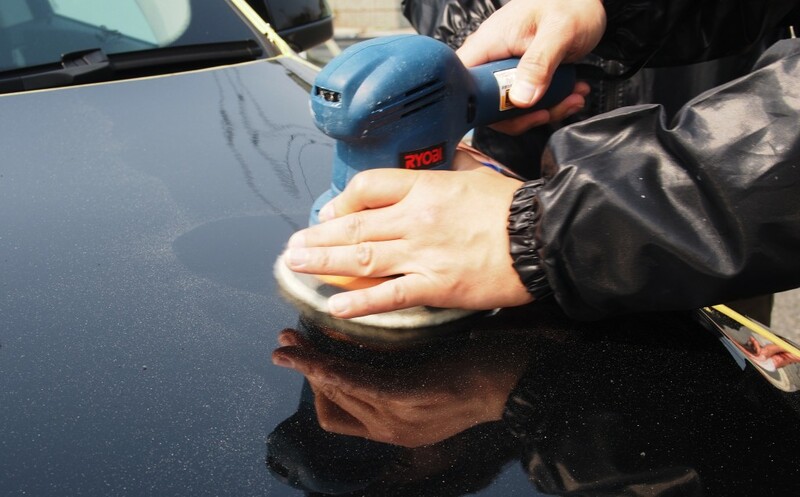 For a second hands car or a car which is covered with scratches and dirt, you need the preparation before application to make glass coating more beautiful. Nowadays many tools and applicators are sold. From the next category, we would like to explain about the way of cleaning up a dirty car as the preparation for glass coating in great detail. 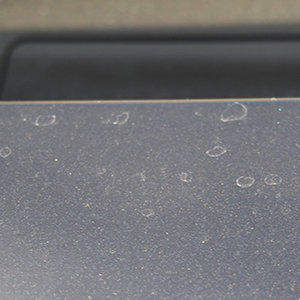 What should we do if a car has already been dirty by scratches and water spots? Although you are eager to get the ultimate gloss, some of you might be anxious it is too late due to many scratches and water spots on your car. However, it is fast to give up! We would like to introduce about how to deal with them carefully!! Scratches which are got during washing and driving a car can be removed by polishing with compound. If scratches cover with a wide area, handwork is getting tough and polishing evenly get hard as well. Therefore, we recommend polishing with a machine on the market. The applications with compound change a little by tools, so we would like to introduce both of them. (1) Wash a car to remove any dust and dirt and dry the car completely. (2) Put proper amount of compound on a sponge. (3) Apply compound straight forward. (4) Move to a next small area and apply using steps #2 and #3 to finish. 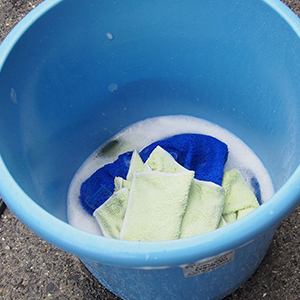 (5) Wash a car completely after polishing and wipe off with a clean microfiber cloth. (2) Put proper amount of compound on a microfiber cloth. (4) Move to next a small area and apply using steps #2 and #3 to finish. (2) Put proper amount of compound on a buffing pad. (3) Move a polishing machine horizontally and buff the area that needs attention. When you apply compound by any ways, please be careful not to polish too much. Moreover, please also make note that the glass layer of glass coating is removed by applying compound. If water spots are not so stubborn, they can be removed by daily car washing. However, if you leave water spots on car body for a long time after raining, they will change to white spots due to crystalize minerals such as calcium when the water evaporate. We call this “Ion Deposit”. It is very strong and stubborn, so it cannot be removed by daily car washing, water spots which we said above can be removed by Pika Pika Rain Water Spot Remover literally. Here is the way of application. (1)Wash a car in advance and remove extra dirt. (2)Put a few drops of Pika Pika Rain Water Spot Remover on cotton, then place the cotton on strong water spots. (3)Put off the cotton in 30 seconds (if water spots are strong, in 1 minute). (4)Wash the car again not to remain Pika Pika Rain Water Spot Remover and wipe off with a clean microfiber cloth. Pika Pika Rain Water Spot Remover is very strong, so if you apply in a wrong way, the glass coating is decomposed itself. Therefore, please make sure three things, “apply in a small area”, “do not leave for a long time” and “wash it off in the end”. We recommend to the machine application of compound. We want to care your car without missing before we must do a hard work, don’t we? Say frankly, one of tips to make a car glossy is double coating. However, the amount of Pika Pika Rain Glass Coating is only 25 ml and it is same size as Zippo lighter. There are quite a few people think like these, but don’t worry about it! Though it is much cheaper than applying by car detailers, we don’t want to throw away the leftover of Pika Pika Rain PREMIUM, do you? Then we would like to introduce double glass coating in this time. It can get more gloss, deeper color and more effective water repellency, too. However, it is suitable for advanced people because you should set a schedule and judge if the letover liquid is able to use to apply coating. Just one more thing, please make note if you fail to apply, it is your responsible. Then in this paragraph, we would like to explain how to apply double coating in detail to reduce mistakes as much as you can. Just read an instruction and apply it normally. After the first applying, please close a cup tightly on the bottle and store it in a cool, dark place such as a refrigerator. The air makes crystalizing fast, so don’t forget to close a cup tightly. Pika Pika Rain PREMIUM needs two weeks to be completed, so please apply after 2 weeks when you applied it first time. If you apply again before completed, there are possibility that wiping and using sponge hurt the first layer. Accordingly please set a suitable schedule. Check the condition of leftover liquid. Here are the check points. Above are signs which has already started to crystalize, so please hold back applying in these situation. Rarely, the liquid is usable but some crystals are on neck of the bottle. In this case, please wipe off the crystals on the bottle with microfiber cloth before you use. After checking the liquid and if it is possible to apply, let’s apply it immediately. Because the hardening is still keep going. Moreover, your car might get dirty during this period, so please wash your car with soft cloth like microfiber cloth, same as the first application. There is possibility to damage the applied glass layer if you wash a car with sponge. Please be careful not to damage a car as much as you can. After washing a car, please apply the second coating on a car which is dried completely. Please apply by following in the instruction again. However, please apply it thoroughly without any carelessness. Also please don’t forget to check whether you apply evenly. Also please DO NOT allow your car get wet for 12 hours after application and approx. 2 weeks to cure completely. [STEP6] Finish re-applying of glass coating! After 2 weeks to cure completely, finally double coating is done!! You need a lot of time from the preparation to the first application finished. Additionally, you need to set the schedule with consideration of the weather, too. So we think that it might be hard a little if you do the second application. By the way, the storage period is around 1 month after you opened the bottle. Though you close the cap tightly, the crystallization goes on little by little. That’s why applying quickly is important. You must pay attention about other cases such as when you leave the cap of the bottle opened a long time and some water and liquid in the bottle are mixed together during the application for some reasons. Because the glass coating liquid crystalize faster than as usual in these cases. It seems like that it will take a long time to do the second application when you read how to apply. However, understanding only a few points and you can get the ultimate gloss with the leftover liquid. This article should be helpful for you who think that you don’t waste the glass coating liquid of it and you’re thinking about the double coating. We’ve introduced the tips above, however, there is more other tips for experts! This is a secret information which is known by only few people in our customers and our staffs. Some of you who have been reading our blog for a long time might understand it. The answer is… applying Pika Pika Rain 2 on Pika Pika Rain PREMIUM!! To be honest, this is not so cost-effective. However, its finishing become the very “ultimate gloss”!! Now, we would like to introduce about required information and the way of applying. Making the glass layer by original method (STG method) which is the highest level percentage of glass and it forms the translucent glass layer. It produces luxuriousness with the attractive deep gloss which people cannot help touching. It refreshes the car gloss quickly like a mirror. The glare gloss is its distinctive quality and it is also different from glass coating’s solid gloss. Please make note that Pika Pika Rain 2 needs to re-apply once a half year to keep its gloss for 3 years. It means that the bottle is usable five times, so please don’t use all at once! When you finish all of the works, there is your precious car with the ultimate gloss in front of you!! Moreover, the durability of protection layer is very nice due to applying glass coating, Pika Pika Rain PREMIUM as the base coat. It is succeeded if the touch changes from squeak like touching a mirror to smooth touch! You need to apply Pika Pika Rain2 once a half year to keep its gloss. When its gloss gets unclear, please apply the leftover again on Pika Pika Rain 2 which has already you applied. ・It is unsuitable for people who need the solid gloss because this method is applied Pika Pika Rain2 on Pika Pika Rain PREMIUM. ・As above, you need to apply Pika Pika Rain 2 many times. On the other hand, glass coating is just once application, so some of you might feel tired of it. ・The water repellency is overwrote with “Hydrophilic effect”. It means that “Water-sliding effect” – the one of the biggest features of Pika Pika Rain PREMIUM cannot be effected fully. This picture is an example of combination with Pika Pika Rain PREMIUM and Pika Pika Rain 2 by our staffs. Please try it if you think like these!! We haven’t said it yet, but Nano Pika Pika Rain Type-K which is recommended officially is excellent with Pika Pika Rain PREMIUM of course! Please use it after 2 weeks when you applied Pika Pika Rain PREMIUM. Then the fresh texture of Nano Pika Pika Rain Type-K is added to the moisture gloss of the glass layer. If you apply only Nano Pika Pika Rain Type-K every time you wash your car, it can keep the gloss and texture continuously. From thinking about the durability and gloss, glass coating is the best. Honestly, everyone has own preference of gloss. Some people like the glare gloss, but others like the moisture gloss. Therefore, in our opinion the “ultimate gloss” can be produced by sets of glass coating and glossy coating products. Future more, you don’t have to worry about the bad effect on the car body by the glass layer because it becomes inorganic after crystalized. In car wax and polymer coating which is short duality, the deterioration and oxidation can be caused if you forget to care about a car. Then there is no more talk about making a car glossy anymore. 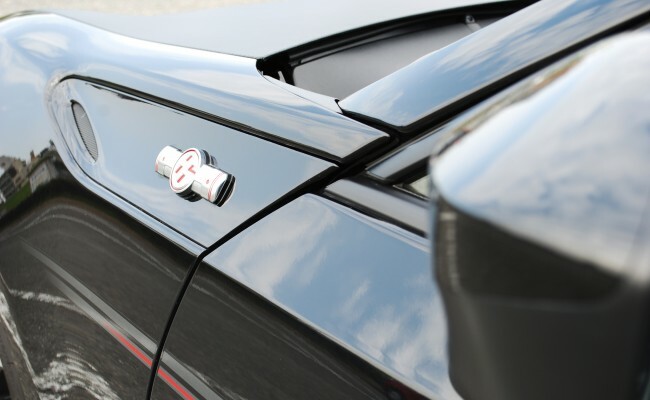 Protecting your precious car should be connected with getting the ultimate gloss. Let’ aim at the ultimate gloss with DIY products!! What is the most cost-effective way of glass coating application? How about the market price for glass coating? Where should we apply glass coating? 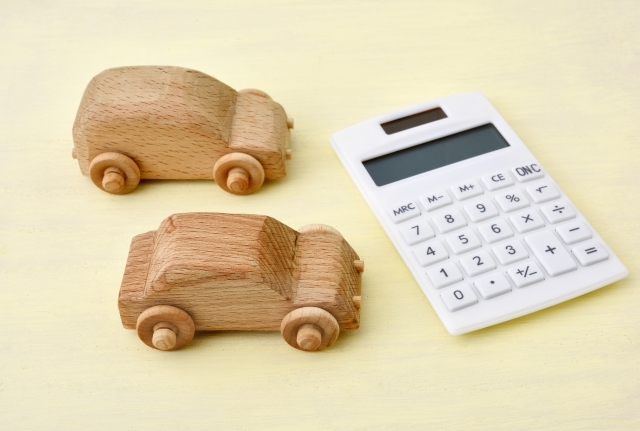 What aspects do you value when you choose and buy a new car? Many people tend to choose as a whole, from its function, price, appearance and so on. A new car when you had loved at first site in the catalog or at the exhibition. It would be great if we could keep the car brand new for long time, wouldn’t it? Applying glass coating to a new car makes it beautiful for long time. Also home car wash and daily maintenance get so easy. 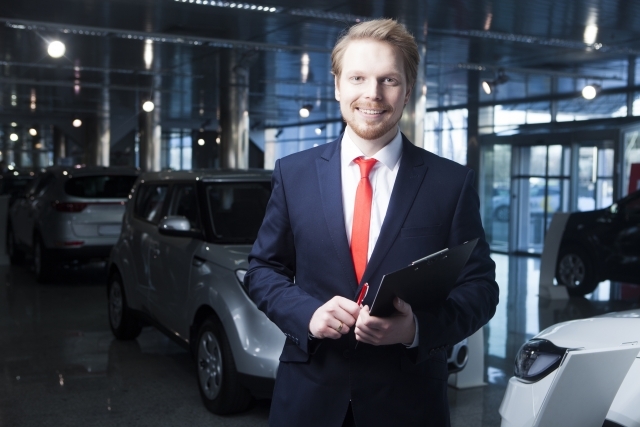 Usually car dealers ask “How about glass coating as an option?” when you decide to buy a new car. However, are we only able to apply glass coating in this way? You can ask dealers to apply glass coating as an option. Some of you might think that you’re going to ask them because you already have relationship of trust with them. From now, we would like to tell its advantage and disadvantage. 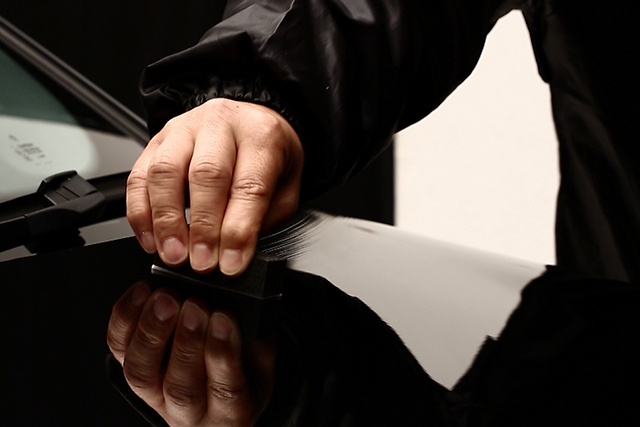 【Advantage】A car is delivered with glass coating. This is the biggest advantage of applying glass coating by car dealers. You can ask them to buy and apply glass coating at the same time, so your new car is delivered with glass coating completely when you get it. You don’t need to bring your new car to the car detailers again and wait a few days until the car detailing finished. It means that you can drive your new car right away! We recommend this way to you emphasize the speed. 【Disadvantage】The optional price is comparatively expensive. On the other hand, the high-cost is the disadvantage. 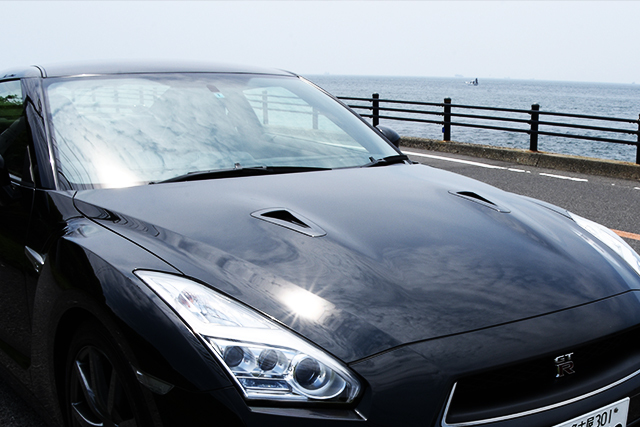 If a car is large, the price for glass coating will rise to around 100,000 JPY. It cannot be helped because it saves a lot of time and effort as we said above, but it is a very serious problem if you want to save costs. Anyway, the price depends on dealers of course. Also it varies depending on the manufacture, type, class, size, model year, color, and painting (such as pearl, metallic…etc.) of the car. Therefore, you should better to check the price before you ask them certainly. Moreover, please be careful the person who applies is like. 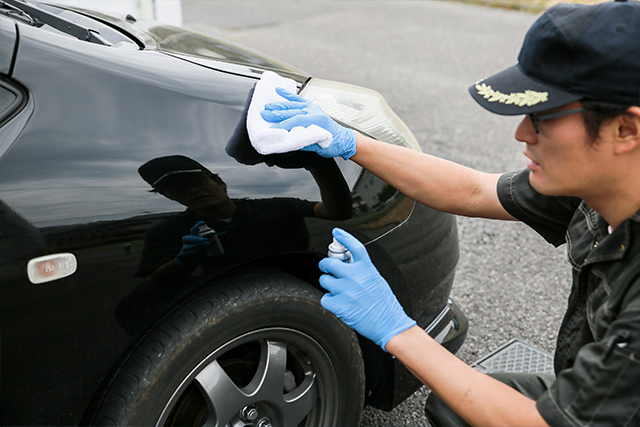 A dealer is not professional of car detailing, such as a car detailer. Therefore, sometimes the person who applies glass coating doesn’t have enough knowledge of glass coating. Otherwise it is worse, he is an absolute armature. Accordingly, we recommend to check who and where applies just in case. Most of you want your car keep beautiful by apart from DIY glass coating, maybe you ask to car dealers as we said in Part1. However, we think that looking for an ideal car detailer can be one of your choices if the price is too high at the dealer or if you want to apply glass coating to a used car. Now, we would like to introduce about its advantages and disadvantages. 【Advantages】They have skillful staffs and plentiful after service. 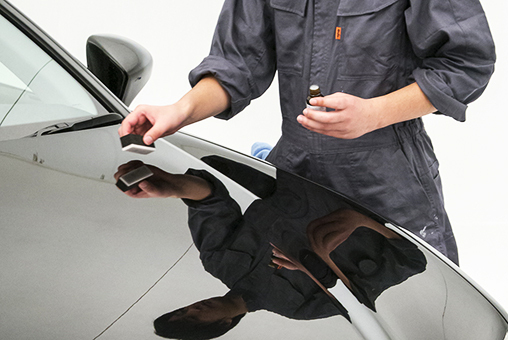 1)Your car gets high-quality finish with their solid skill from preparation to glass coating. -However, you need to research reviews and ask detailers directly and it is very difficult to find out the reliable car detailer. 2)Most of them have sincere guarantees such as a regular inspection. -This point is recommended to you who hesitate to control your car condition. Some of them inform a regular inspection diligently. Moreover, their inspection is covered with not only outside but also inside and if you have one of them close to you, car maintenance will get easy. 3)3-	They solve troubles which you cannot deal with them by yourself. -They are very reliable when you are in trouble with recovering your failure of DIY glass coating, removing terrible scratch or strong water spots and using a professional machine. 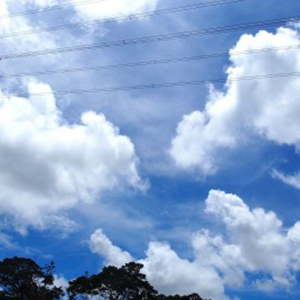 【Disadvantages】It is very costly and there is possibility that they tell a lie. 1)If you ask them to apply glass coating, not easy polymer wax is so expensive. -Of course, car detailers are cheaper than car dealers, but you feel that it is more expensive than DIY because it needs labor costs and technical fee. -coating before delivery of your car, but, on the other hand, you need to leave your car even though you have been using, so, it is inconvenient. Some car detailers provide an alternative car, so you would be better to ask. 3)Most of their regular inspection is essential. Please check applying fee includes regular inspection. However, some of them ask us to pay the regular inspection fee every time. In spite of long durability of glass coating, total cost effect could be bad in the end if we have to pay every inspection. 4)They only apply polymer coating or wax as if it was glass coating. -Most of car detailer’s original glass coating meet this case. 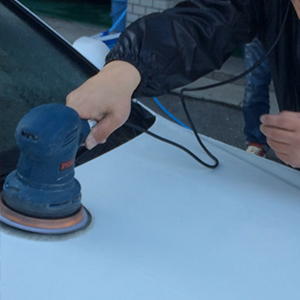 Especially, the easy car detailer with gas station tend to call all similar products as “glass coating”, but they are actually “glass-like-coating”. We understand it is difficult to find out real glass coating, but let’s compare and examine from gathering information as much as you can. To be honest, there is not a big difference between professional and amateur in glass coating finish. However, preparing the surface such as polishing and buffing requires technique and makes the difference. If you are not satisfied with DIY results and seek the perfect ones, please consider about asking car detailers once. If you want to save costs, applying by yourself is the best! These days, quality of glass coating products on the market is getting better and better, so you can get same durability and gloss as applying by car detailers unless you don’t choose a bad product. Then we would like to introduce about its advantage and disadvantage below. We might think that this is the most important point. 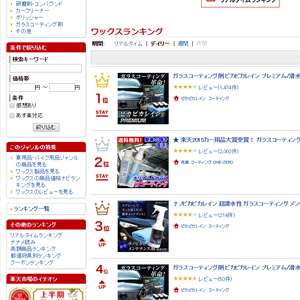 If you ask to car dealers or car detailers, they need several ten thousands Yen at least. However, if you do it by yourself, applying fee is FREE!! Furthermore, DIY glass coating products can be applied easily and the results look like professional. There are many products which can be applied in 3 hours (or less than it). You must have good eyes to tell the difference between a real glass coating and a glass-like-coating. Some of you might have a question like this. For us, Pika Pika Rain defines real glass coaling as liquid change to real glass after crystallized and it protects a car. .1) You need to apply the product once or twice a year. .2) Liquid doesn’t harden and changes to soft silicon, not glass. Please be careful these products before you buy because they don’t last long like real glass coating. Pika Pika Rain Glass Coating change to glass layer after crystallized and a car is protected by it, so you can use it without any worries! 【Disadvantage】You should do everything on your responsibility. For example, if there are many scratches on the car body, you have to polish the car. Also if oily dirt still on the car body, you have to remove it, too. If you fail to apply and glass coating is not applied unevenly, it’s just your fault. Unfortunately, you must deal with it on your responsibility. You need be careful not to get the car wet for certain period. The method of preservation and the weather as well. Glass coating is difficult to be removed once it’s happened, so that’s the very reason for ensuring that preparation should be perfect with reading the instruction. You should be better to ask to the manufacture by phone or email if you have any questions. About Pika Pika Rain, please contact us below any time!! Perfect preparation makes glass coating professional quality finishing!! The preparation is the most important work before applying glass coating. The answer is that glass coating cover car paint surface with glass layer as it is. It means that glass coating finishing is reflected by the condition of car paint surface directly. Of course things to do will change by car’s condition. Then we would like to introduce about varieties of preparation as an extra article. When you check your car carefully, there are many scratches and water spots which is adhered to the car body even though you care about it passionately. Unfortunately, you cannot help it. However, Pika Pika Rain Liquid Compound can remove scratches and water spots (Ion deposit) by polishing the surface thinly and make it fine. Always the oily dirt is on car paint surface. It is not only daily dirt but also remaining car wax and coating which you applied before. Oil remover can deal with them. 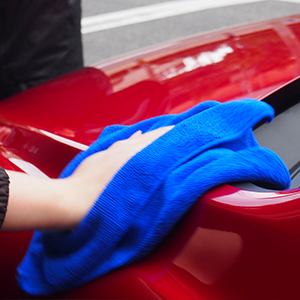 Removing oily dirt makes glass coating easy to adhere to the car body. Gloss and durability of glass coating is changed by how close it bonds to painted surface, so we recommend to adopt this work as possible. Please make note that there are two types of oil remover in the car care market. The one contains alcohol and another contains oil. 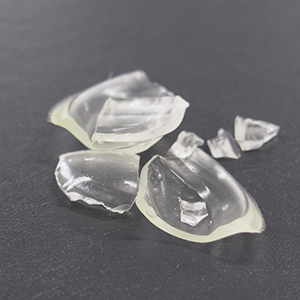 Pika Pika Rain Glass Coating contains alcohol, so please choose the same type of oil remover. Water spots are very hard to be removed by daily washing. Pika Pika Rain water spots remover is possible to remove them easily. It is simpler than using polishing machine, so we recommend to apply for partial water spots. A new car doesn’t have remarkable dirt and scratch, so we think that polishing with compound is not necessary. Glass coating lasts long by applying oil remover. In this case, you must do preparation. Polish with compound completely and remove scratch and dirt on the car body. If you apply in above steps, the beauty of glass coating is brought out! Find a combination to fit your budget and lifestyle. We introduced about car dealers, car detailers and DIY glass coating. We hope you understand each advantages, disadvantages and the market price. Please don’t forget that the market price is only a target figure, so that asking car detailers to make a quotation is the best way to check the exact price. If you cannot find your best style from three ways which we introduced, how about these combinations below? Actually, some of our customers bring Pika Pika Rain Glass Coating to their favorite car detailers and ask them to apply it. You need to discuss with them, but there is worth to try it if you have any friendly car dealers or car detailers. Also our other customers ask car detailers to remove scratches, water spots and iron filings which they reluctant to do. Then they apply Pika Pika Rain by themselves. Everyone has own idea about which points they want to save. For example, time, price, effort…etc. Please compare and examine your preference and compromise points until you can find the best way to apply glass coating!